Party season is upon us, and so I’m sharing one of my favorite go-to party recipes, a curried pea dip that takes 10 minutes to prepare. It’s sweet and spicy and looks pretty in a white bowl. This is one of my mom‘s recipes, from her book The Nut Gourmet. She drizzles it with pomegranate syrup and calls it hot karachi pea dip, because she’s much cooler than I am. If you are serving it for a holiday appetizer, feel free to get crafty and form it into a tree or a wreath–with tiny red bell pepper pieces for ornaments! Serve it with crackers or celery sticks. You can even use it as a spread in a roasted vegetable sandwich, or as a topping on a flatbread pizza along with feta or goat cheese. Even better, it’s a pantry recipe, if you keep a bag of peas in the freezer and have a lemon or a bottle of lemon juice in the fridge. Put all ingredients in the food processor and mix until blended and creamy. Serve warm or room temperature with crackers and celery. Can be made up to 2 days before serving. This entry was posted in Appetizers, Healthy, Holidays, vegan, vegetables by Amy. Bookmark the permalink. This looks so amazing! 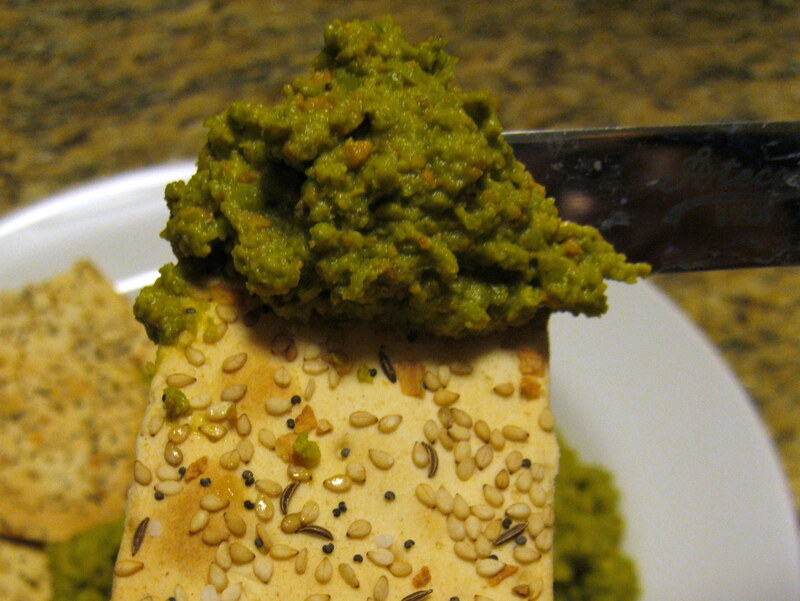 I don’t think I’ve ever seen a dip that uses peas for a base… it’s genius, and so healthy!